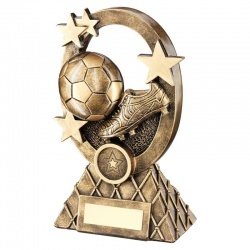 An extensive collection of engraved football trophies and awards, including affordable resin football trophies, stylish glass football awards, footballer figure awards and trophies for individual soccer player achievements. 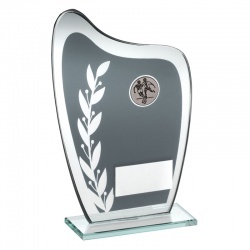 All these football trophy awards are offered with custom engraving of the base plaques, allowing you to create unique and personalised trophies for your football stars. NEW for 2019! All trophies tagged NEW are fresh for 2019. 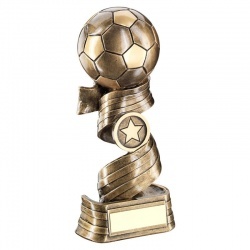 Resin trophy with 3D ball on aged bronze finish column, with base plate. 4 sizes. 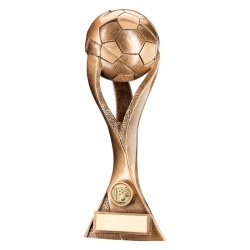 Resin trophy in bronze & gold colour finish, with 3D football and base plaque. 4 sizes. Resin figure in bronze & silver finish with laurel leaf. 4 sizes. 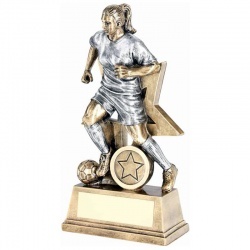 Resin female footballer figure in bronze & silver finish with garland. 4 sizes. 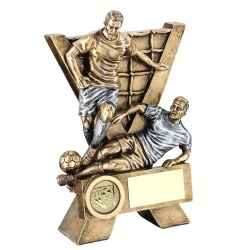 Detailed resin trophy with two footballers, one making a sliding tackle. 3 sizes. 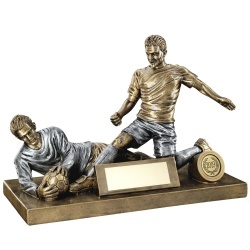 Detailed resin trophy in bronze & silver with goalkeeper saving at feet of opponent. 6.75in tall resin figure of 'beast' footballer, in bronze colour finish. 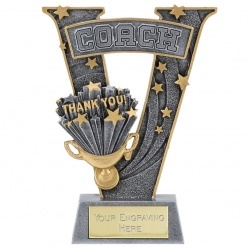 Resin V-shaped award with 'Thank You Coach' legend on base with engraving plaque. 7.25in tall. 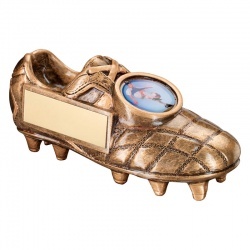 Resin 3D football boot in gold colour finish with engraving plaque. 3 sizes. Detailed resin figure of female footballer in action, on base with plaque. 4 sizes. 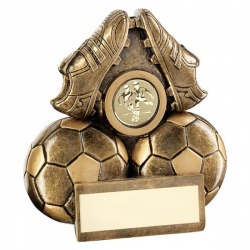 Low-cost resin football award with footballs & boots on base with plaque. 3 sizes. 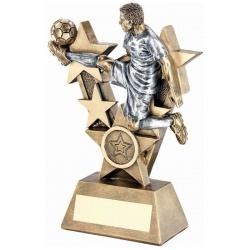 Affordable resin trophy in bronze & gold with star and football. 3 sizes. 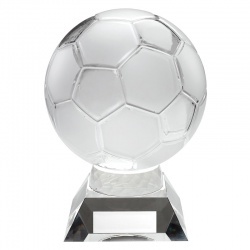 Resin trophy with 3D ball on aged silver finish column, with base plate. 4 sizes. 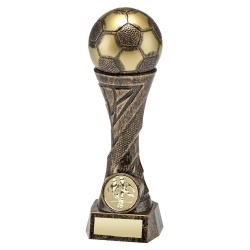 Resin football trophy in bronze & gold colour finish, in pierced design. 3 sizes. 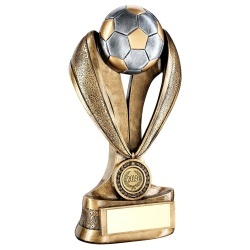 Resin football trophy in style of ribbons and medal, with 1in centre and base plaque. 4 sizes. 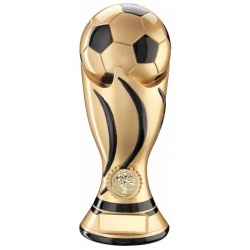 Fully 3D football on tapered column with 1in centre & base plaque. 4 sizes. 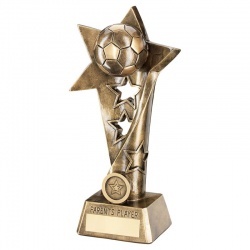 12in (305mm) tall resin 'Parent's Player' award trophy with fully 3D ball. 12in (305mm) tall resin 'Manager's Player' award trophy with fully 3D ball. 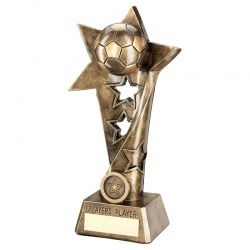 12in (305mm) tall resin 'Most Improved Player' award trophy with fully 3D ball. 12in (305mm) tall resin 'Player's Player' award trophy with fully 3D ball. 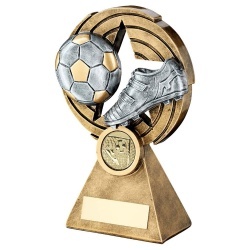 Resin football trophy with ball & boot on star design backdrop, with base plaque. 3 sizes. 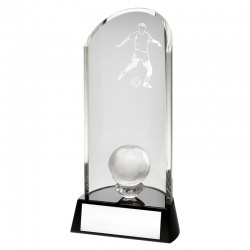 Resin trophy with goalposts, boot and ball on base with plaque. 3 sizes. 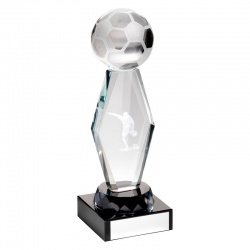 Affordable football trophy in resin with football. boot & engraving plaque. 3 sizes. 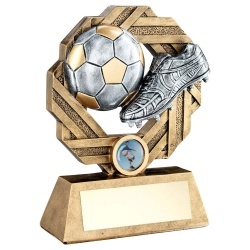 Resin award in silver & gold with football & boot on laurel garland backdrop. 3 sizes. 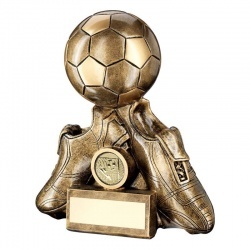 Football trophy with pair of boots and 3D ball, in bronze & gold resin. 3 sizes. 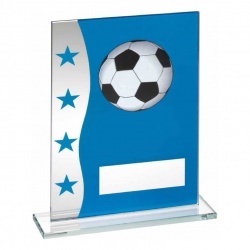 Rectangular glass plaque in silver and blue with football motif. 3 sizes. 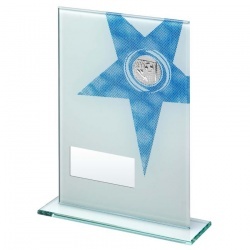 Rectangular jade glass plaque with blue star & football theme insert. 3 sizes. 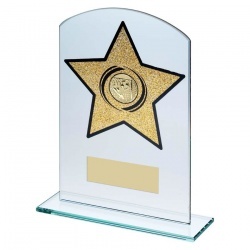 Jade glass plaque with curved top, gold star & football theme insert. 3 sizes. 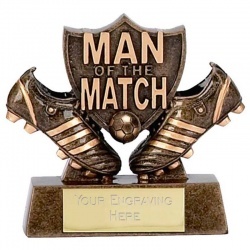 Modern black glass plaque in peaked design with football inset. 3 sizes. 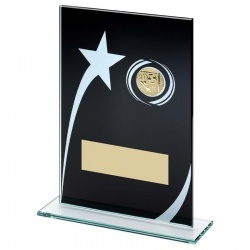 Rectangular black glass plaque with silver star & football theme insert. 3 sizes. 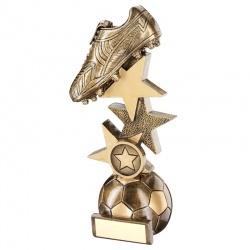 Resin award in antique gold finish, with football boot, stand, and base plaque. 4 sizes. 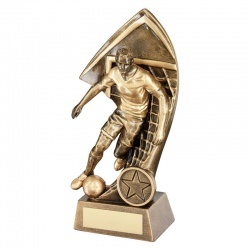 Detailed resin football award with ball, boot & geomatric backdrop. 3 sizes. 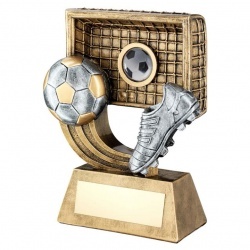 Detailed resin football award with ball, boot & backdrop. 1in centre & base plaque. 3 sizes. 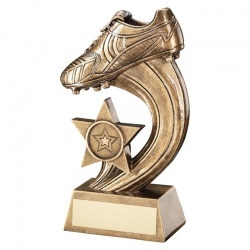 3D Resin Football Boot Award with Plaque. 3 sizes. 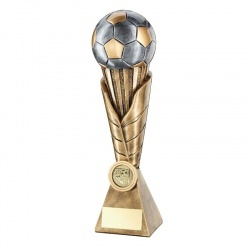 Chrome finish football trophy with full 3D ball, 1in centre and base plaque. 5 sizes. 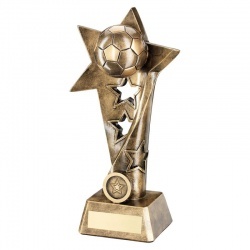 Resin 3D football award with star stem in bronze and gold colour finish. Resin 3D football trophy with ribbon stem, in bronze and gold finish. 3 sizes. 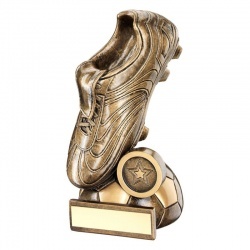 Resin football boot trophy in antique bronze finish. 10.5in tall. Clear Glass Column with Football, on Black Glass Base. 3 sizes. Supplied boxed. 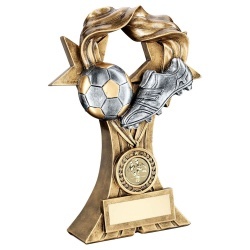 Detailed football scene trophy in resin with bronze and gold colour finish. 3 sizes. 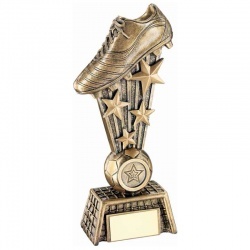 Detailed resin football boot trophy in bronze and gold colour finish. 4 sizes. 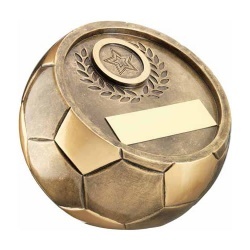 Resin Football Award in Bronze & Gold Finish with Base Plaque. 3 sizes. 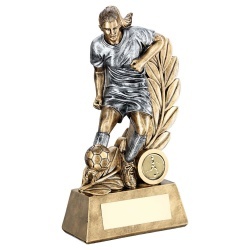 Detailed resin figure of female footballer in action, in bronze and gold colour finish. 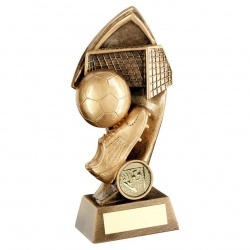 Affordable resin football scene trophy in bronze & gold colour. 3 sizes. 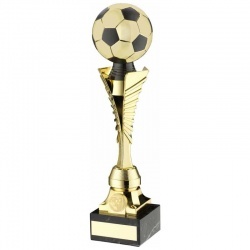 Affordable football trophy with plastic body in gold colour on marble base. 4 sizes. 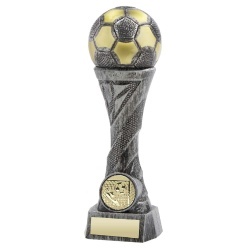 Mini trophy (3.25in / 8cm tall) in resin with bronze & gold finish, on base with plaque. 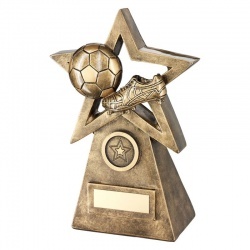 Resin star with football boot and ball, on base with plaque. 2 sizes. Fully 3-D football on three prong riser with base plaque. 11.5in tall. 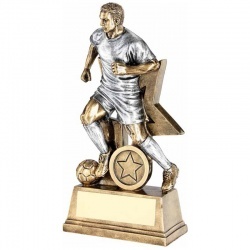 Detailed resin award with footballer figure, in silver and gold colour finish. 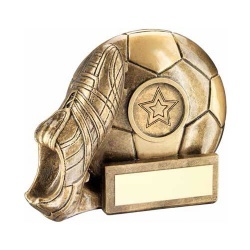 Resin football-shaped award in bronze and gold colour finish with engraving plaque. 3 sizes. 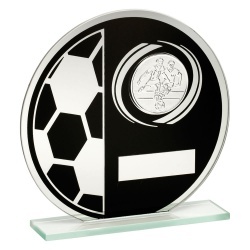 Circular Football Plaque in Black / Silver Glass. 3 Sizes. 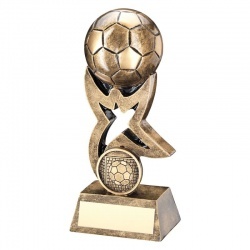 Versatile resin football trophy in bronze and gold colour finish with base plaque. 3 sizes. 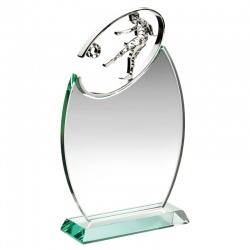 Detailed resin figure of defender making a tackle, in silver and bronze finish. 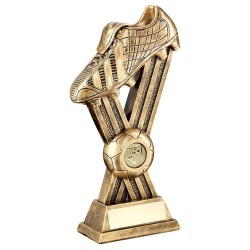 Resin trophy with full 3D football boot in bronze and gold colour finish. 4 sizes. 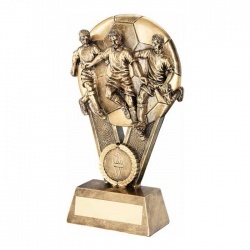 Detailed resin trophy with three players on football backdrop, with base plaque. 3 sizes. 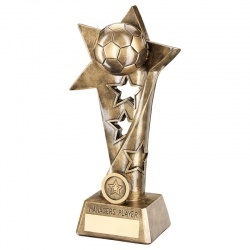 Great value resin football star award in bronze and gold colour finish. 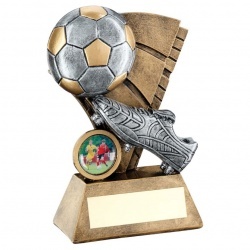 Versatile resin football trophy in black and gold colour finish with base plaque. 3 sizes. 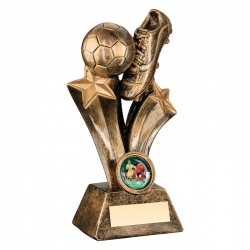 Bronze and gold resin award with football boot & ball. 6in. 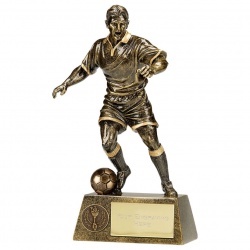 Detailed resin footballer figure in bronze and silver colour finish, with base plaque. 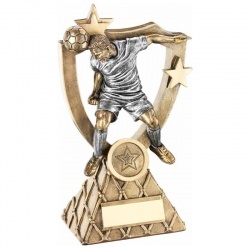 Resin figure of male footballer in silver & bronze colour finish. 5 sizes. 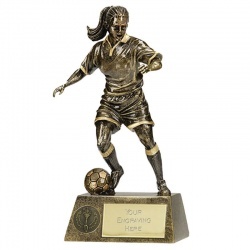 Detailed resin female footballer figure in silver and bronze colour finish. 3 sizes. 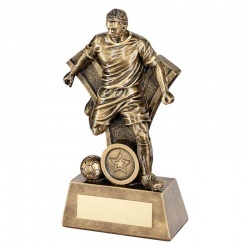 Detailed resin figure of male footballer on bevelled base with plaque. 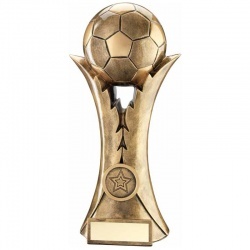 Resin trophy in bronze and gold colour finish with 3D football on star column. 4 sizes. 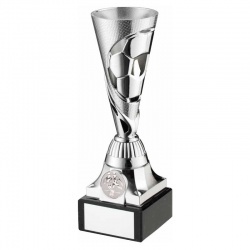 Silver coloured plastic vase trophy cup with football theme, on marble base with plaque. 3 sizes. 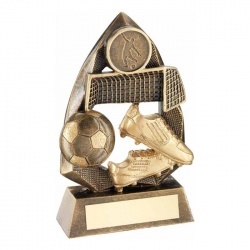 Bronze and gold resin award with football boot & ball. 7in. 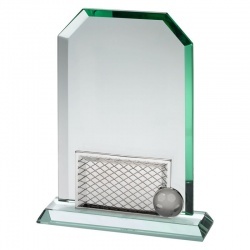 10mm thick jade glass plaque with goal posts. Supplied boxed. 3 sizes. 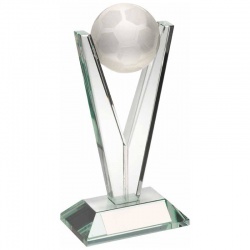 Jade glass trophy in modern V-shape design with 3D glass football. 2 sizes. Jade glass plaque in arc shape with 3D football motif, and engraving plate. 3 sizes. Jade glass oval plaque, metal footballer figure. Supplied boxed. 3 sizes. 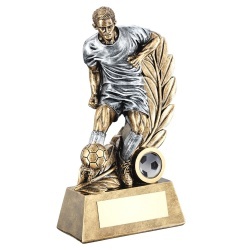 Detailed resin football scene award with male footballer, with base plaque. 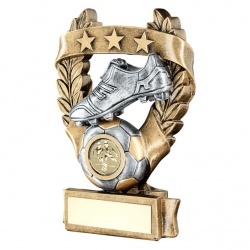 Resin football trophy with 3D boot on curved stem, in bronze colour finish. 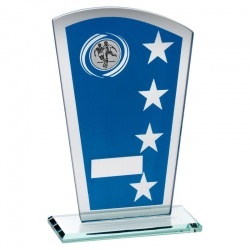 8in Tall Blue/Silver Glass Football Shield Award with Engraving Plaque. 3 sizes. 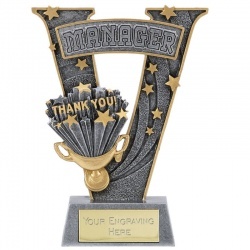 Resin V-shaped award with 'Thank You Manager' legend on base with engraving plaque. 7.25in tall. 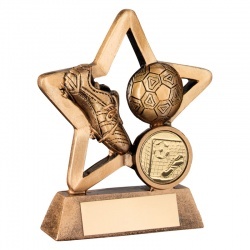 Bronze and gold resin award with football boot & ball. 8in. 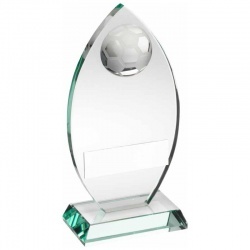 Crystal glass football set on beveled base with plaque. Supplied boxed. 3 Sizes. 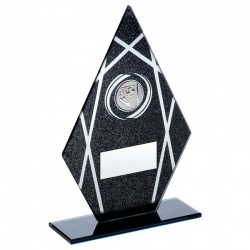 Grey / Silver Glass Shield Award with Engraving Plaque. 3 sizes. 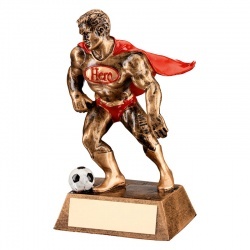 6.25in Resin Football Superhero Figure on Base with Plaque. 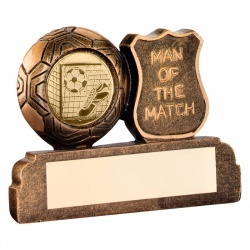 2.5in Resin Football Man of the Match Trophy with Plaque. Resin trophy in gold and black with 'Manager's Player' legend above the base plaque. 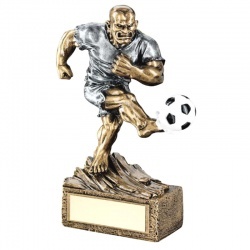 Detailed resin figure of male footballer in action, on base with plaque. 6 sizes. Resin 3D football on star column in bronze with legend 'Managers Player'. Resin football trophy in black and gold finish with 'Most Improved Player' legend. 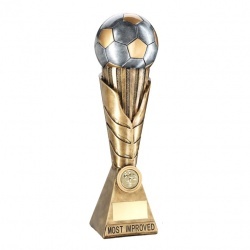 10.25in tall resin bronze football trophy with 'Most Improved Player' legend. Resin trophy in gold and black finish with 'Parents Player' legend over engraving plaque. 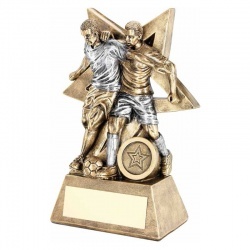 Resin 3D football trophy in bronze and gold with 'Parents Player' legend. 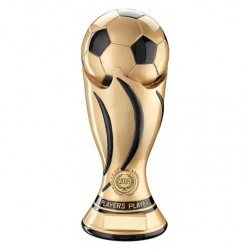 10.25in tall resin bronze football trophy with 'Players Player' legend. 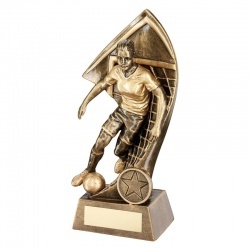 11in resin football trophy in gold and black finish with 'Players Player' legend. 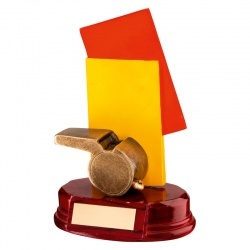 Resin referees award with whistle and cards on base. 6.75in tall. 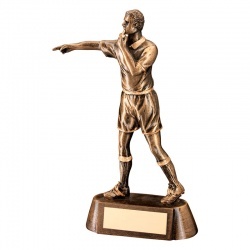 6.75in tall bronze and gold referee figure with base plaque. 6.25in Clear Glass Column with Football, on Black Glass Base. 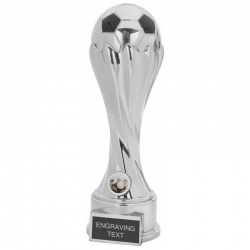 Buy football trophies and awards online with low, fixed-cost text engraving, free logo engraving, low cost delivery and fast turnaround on your order. 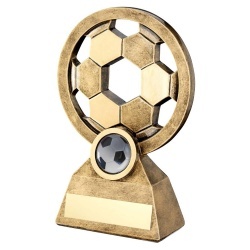 Ideal for coaches and managers, league organisers, schools teachers and club officials, this collection of resin cheap football trophy awards and crystal football trophies is priced to sell. 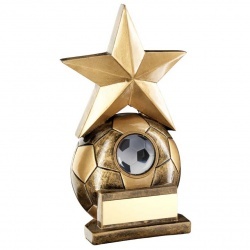 The range includes womens football trophies, football goalkeeper trophies, football top scorer awards, football most valuable player awards, football man of the match awards, and football golden boot awards trophies. 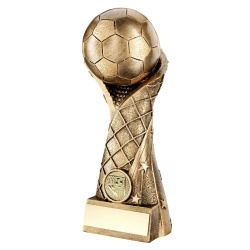 Browse the selection of engraved soccer trophies above and click on your choice for full product details.